Pinyon-Juniper, affectionately called "PJ", dominates the slopes above the sagebrush and below the ponderosa belt in southern and western Colorado. Neither the pinyon (Pinus edulis) nor the juniper (Sabina sp.) usually grows higher than about 10 feet tall, and both tend to grow widely spaced. 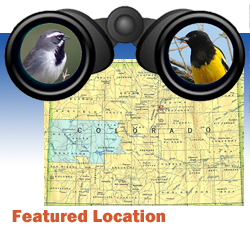 Associated birds include Black-chinned Hummingbird, Cassin's Kingbird, Gray Flycatcher, Gray Vireo, Pinyon Jay, Bewick's Wren, Juniper Titmouse, Bushtit, Black-throated Gray Warbler, Black-throated Sparrow, and Scott's Oriole (rare).